As an author working hard to gain exposure and popularity for my book, REVIEWS are critically important and greatly appreciated – especially when they are positive! I am grateful for all the 5-star reviews the book has received on Amazon.com (please leave one if you’ve read and enjoyed the book). Regardless of whether or not you’re looking for guidance on improving and building up a business, readers will doubtless come out with a wealth of business-related knowledge previously unknown to them (in addition to a lot of Troma trivia). You can read the full Fupping.com review here. If you have read the book and enjoyed it, please leave a review on Amazon. It helps a lot, especially when a book has 100 or more reviews. If you haven’t read the book, please consider buying it, or if you prefer, you can read it for free (over time, chapter by chapter) here and on Medium. 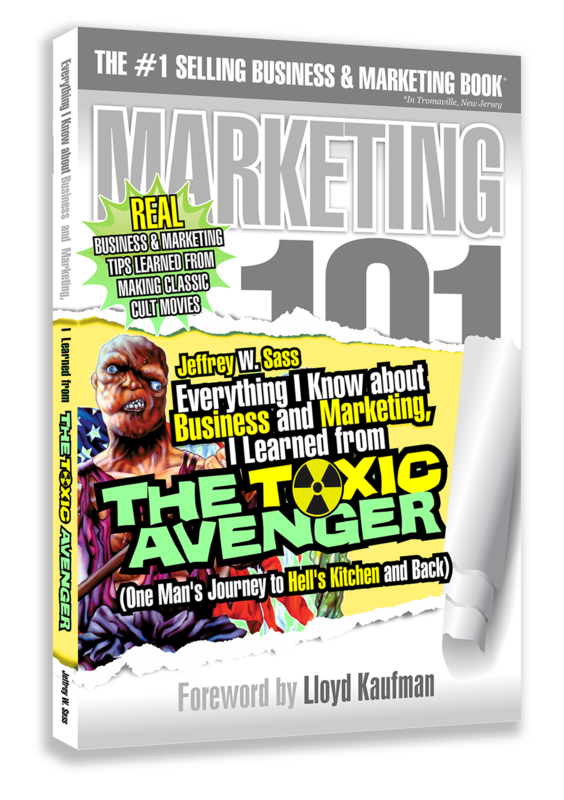 ‘Tis the season… of the sale, and my book, Everything I Know about Business and Marketing, I Learned from THE TOXIC AVENGER is no exception! Now through November 30th, you can get the Kindle Version of the book for only $0.99! Yep, that’s less than one buck… less than the cost of a few sips of that FrappaZappaTiniLatteLeche you’re drinking… and far more fulfilling! The Kindle version normally sells for $4.99 so you’re getting a whopping 80% off a book that is guaranteed to make you smile and get inspired by business and marketing tips you can actually use! Watch the short video below for some highlights of the 5-star reviews on Amazon! And don’t be shy… spend a buck and buy the book! Thanks!!! 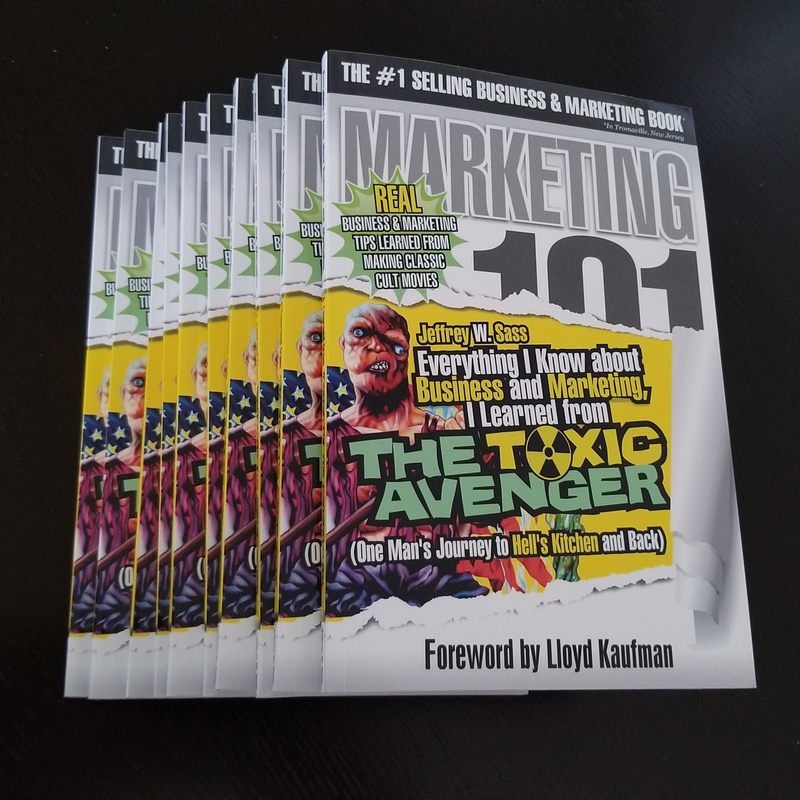 https://everythingiknowabout.marketing/wp-content/uploads/2017/11/Copy-of-Toxie-Says-Buy-this-book-11.png 800 800 Jeffrey Sass https://everythingiknowabout.marketing/wp-content/uploads/2017/04/Untitled-5-6.png Jeffrey Sass2017-11-25 11:56:142017-11-25 11:56:14Black Friday/Cyber Monday Sale: Kindle Version On Sale Now for $0.99! Many years after my stint in Tromaville, I had the pleasure and opportunity to work with business cartoonist Hugh MacLeod and his business partner Jason Korman at their unique “culture design” agency, Gapingvoid. Hugh has an uncanny talent for looking at complex business problems and distilling them into a simple image and a few words that resonate, connect emotionally, and have the power to instigate real change within an organization. Jason has such a clear vision and understanding of marketing and corporate culture that, combined with Hugh’s artistic insight, the two and their team have attracted some of the world’s biggest and best-known brands as clients, from AT&T, to Microsoft, to the University of Miami, to Zappos, and countless more. It was a great experience working with Hugh and Jason and we share many of the same views about marketing and culture, which is why I started with them first as a fan of Hugh’s work. The image above is one of my favorites, and reminded me of a particular chapter in my book, Chapter 10: Find Something to Believe In. 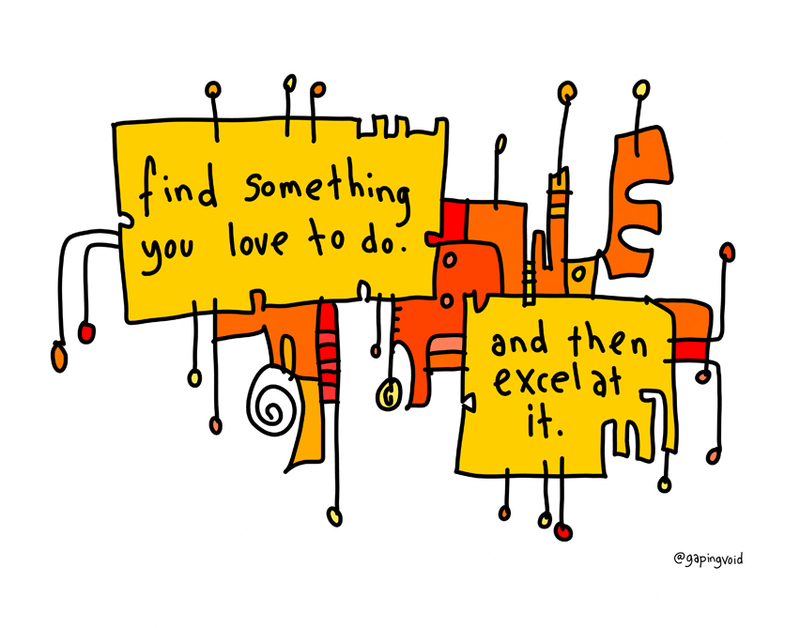 When I pointed that out to Jason, he was kind enough to share that chapter, along with the above image, in the popular Gapingvoid Daily Newsletter. If you are not familiar with Hugh and Gapingvoid I encourage you to learn more about the Gapingvoid Culture Design Group and also browse some of the great prints and gift items available at Gapingvoidart.com. And you can CLICK HERE to read the newsletter edition with Chapter 10 of my book. Enjoy! I was an awkward kid and not into things like “going outdoors” or “maintaining friendships.” So I spent literally every day watching movies—either rented from the local video store or whatever was on late-night TV. I was into cult films and low budget stuff, so one of my favorite movie studios was Troma. With that in mind, I was happy to send David a copy of Everything I Know about Business and Marketing, I Learned from THE TOXIC AVENGER. I was eager to get his feedback, and honored when he chose to write about the book. Jeffrey took all of his absolutely batshit crazy experiences at Troma and turned them into a marketing how-to book with the best title ever… What’s great about the book is it actually serves a dual purpose. 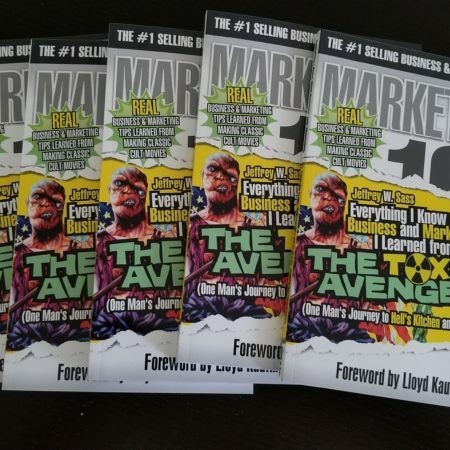 One part memoir, one part marketing guide—Everything I Know offers short digestible stories of the madness Jeffrey experienced while at Troma and pulls simple marketing lesson from the somewhat organized chaos. You can read the full review at TheDaddyComplex. And while you’re at it, don’t forget my book! DNJournal: New Book Reveals .CLUB Superhero Jeff Sass Owes His Marketing Powers to The Toxic Avenger! Ron Jackson is a former TV News Reporter and station Sports Director. He is a consummate journalist that today serves as Editor and Publisher of Domain Name Journal (DNJournal.com) the highly regarded online Trade Publication for the Domain Name industry. I recently gave Ron a copy of my book when we were both at the Domaining Europe conference in Berlin. Ron must have had a boring flight back to the U.S. because he had the time to read the book along the way. He also seemed to like it and wrote a great and fun article about it in his popular “The Lowdown” column. What Sass can do is spin some fascinating yarns about his days in the late 80s and early 90s with legendary New York City-based cult movie production house Troma Entertainment where he spent more than seven and half years in film production, marketing, acting and assorted mayhem… Jeff learned many valuable and timeless business and marketing lessons from his experiences at Troma and he shares the best of those in his new book – in each case noting how the specific lesson learned can be applied in any business or marketing campaign today. I mentioned that Ron is the consummate journalist. As such, it seems he could not read my tales of movie mayhem without getting a firsthand taste of Tromaville himself. So after returning from Berlin, it seems Ron did a bit of B-movie binge-watching, turning to Tromatizing his Netflix account by watching The Toxic Avenger, Sgt. Kabukiman, NYPD, Rabid Grannies, and more. And Ron still wrote a great article about Everything I Know about Business and Marketing, I Learned from THE TOXIC AVENGER. You can click here to read his complete article on The Lowdown. 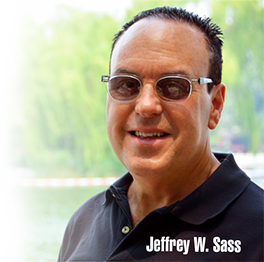 https://everythingiknowabout.marketing/wp-content/uploads/2017/06/dnj-newmast-pin5.jpg 116 271 Jeffrey Sass https://everythingiknowabout.marketing/wp-content/uploads/2017/04/Untitled-5-6.png Jeffrey Sass2017-06-07 21:10:402017-06-25 11:57:20DNJournal: New Book Reveals .CLUB Superhero Jeff Sass Owes His Marketing Powers to The Toxic Avenger! As you can imagine, when publishing a book, the reviews it receives carry a lot of weight in helping others decide whether they want to purchase and read it. I can remember in the good old moviemaking days how we waited with baited breath for the reviews to hit for our films. Even in Tromaville, reviews mattered and we were always thrilled when one of our meager movies got noticed by a mainstream reviewer. Like when Stephen Holden of the NY Times said Sgt. Kabukiman, NYPD, “…is funny in a Mad Magazine-manque sort of way…” That was a great review (and compliment). Even the late, great, Roger Ebert was often kind with his thumbs when it came to Troma’s fare. 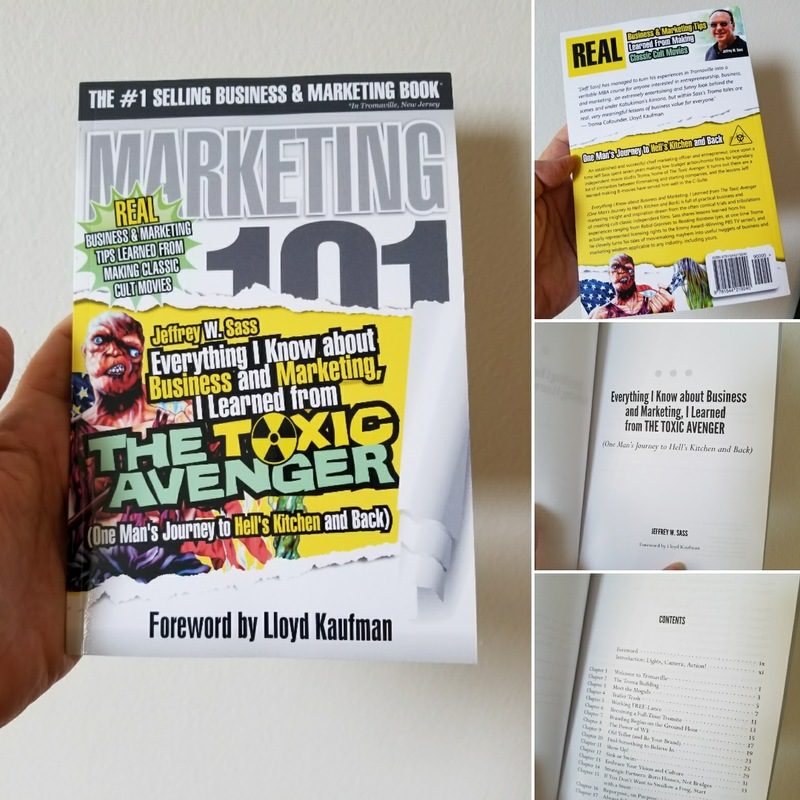 As for my book, while it has only been a few weeks since Everything I Know about Business and Marketing, I Learned from THE TOXIC AVENGER has been published, the initial reviews on Amazon.com have been very positive. It is great to hear from people who have spent a few bucks and taken the time to read my words, especially to hear that they found value and inspiration from the stories and lessons I share in the book. What can be learned from the B-movie industry? A lot, as it turns out. Brand consistency and predictability is important there as it is for Louis Vuiton. Jeff’s stories of the Hell’s Kitchen low budget studio are not only funny, they are highly transferable to other industries and environments… I cannot recommend this book highly enough, and I would put it up there with books like “Positioning” by Reiss and Trout if you want to really understand how marketers think. If you like movies, super heroes or have ever wondered what the real business of the independent film industry is like, you’ll enjoy this book and have great takeaway points about how to build and promote your products and services. I’ve read a lot of business and marketing books that include banal examples from Corporate America. 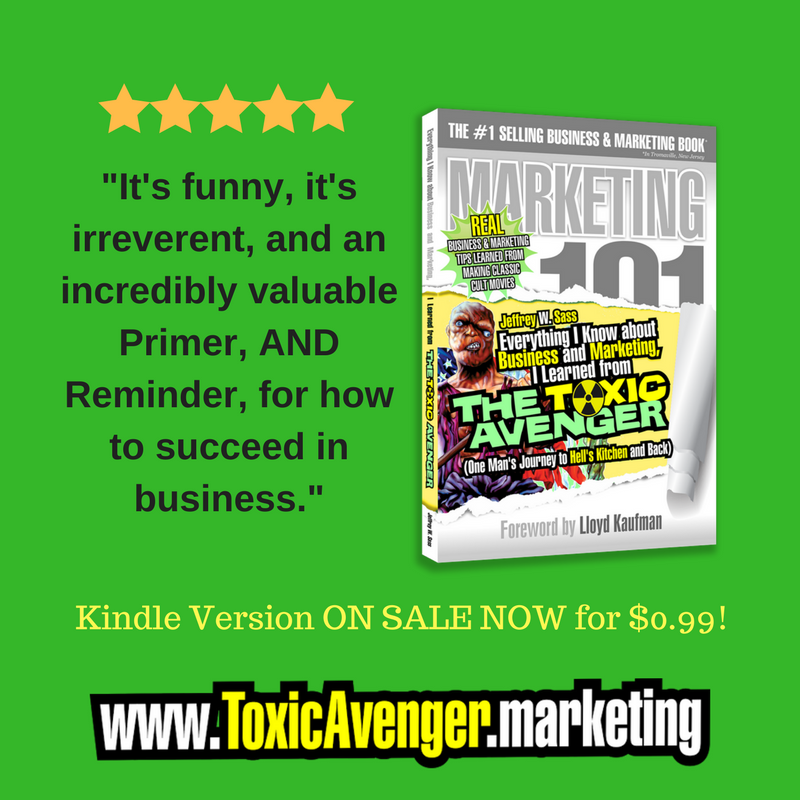 This book is very different; it brings life to business lessons such as the importance of teams through colorful stories from the author’s personal experience at B-movie studio Troma. Several of the business lessons are ones I haven’t heard anywhere else and make a lot of sense. I highly recommend picking up this book. A delightful read! Engaging and educational at once. Jeff has a colorful and extensive background and I had numerous take-aways that I will apply in business and life – highly recommended. https://everythingiknowabout.marketing/wp-content/uploads/2017/05/five-stars-2.jpg 300 255 Jeffrey Sass https://everythingiknowabout.marketing/wp-content/uploads/2017/04/Untitled-5-6.png Jeffrey Sass2017-05-28 15:56:502017-06-25 11:58:43And the Reviews are in!